And other stats from Resident Evil 2's first week. 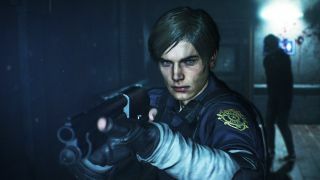 Capcom's Resident Evil 2 Remake stats have been updated with a bunch of data from the first few days of the game's release. This doesn't capture everyone's experience with the game—just those who enabled sharing their play data with RE NET at the start—but it offers a pretty decent snapshot of the player base. The headline stat: 79 percent of players chose Leon S Kennedy for their first playthrough, while the other 21 percent opted for Claire Redfield. In Claire's defence, she is listed second on the menu when you start the game. In total, 1.985 million have so far played as Leon, while 1.05 million have played as Claire. 584,004 players have cleared the game as Leon, while 336,408 have done so as Claire. Some of the other starts are arbitrary, but fun nonetheless: 132 million zombies have been killed at the time of writing, which, as Capcom notes, is over twice the population of the UK, and more than the population of Japan. Handguns have been used 861 million times in the game, which says a lot about how tough those zombies are to take down with bullets (or the average player's accuracy). Capcom also lists which items have been discarded the most throughout the game: subweapons like grenades and knives make up 33 percent of the almost 17 million items that players have tossed away, while herbs follow at 26 percent. Maybe I'm just overly cautious, but I'd never throw away either of those items in a game where you're always challenged with limited resources. The Tyrant, meanwhile, subject of many jokes on Twitter for his size, ludicrous hat and absurd coat, has stalked players across 7.6 million kilometres. Somehow Capcom has measured that players have spent over 53 years in total trying to solve puzzles. You can log in and check your own stats, too, by clicking the Overview tab on the stats page and connecting your Steam account.